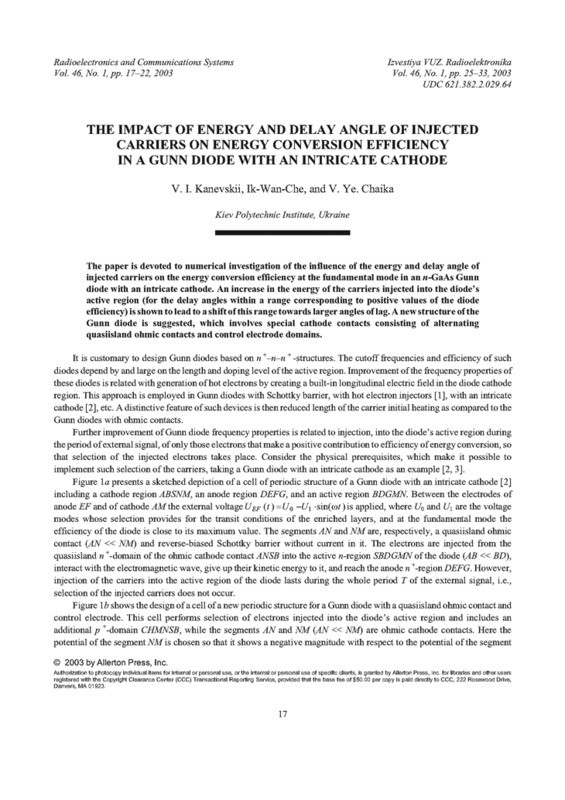 The paper is devoted to numerical investigation of the influence of the energy and delay angle of injected carriers on the energy conversion efficiency at the fundamental mode in an n-GaAs Gunn diode with an intricate cathode. An increase in the energy of the carriers injected into the diode’s active region (for the delay angles within a range corresponding to positive values of the diode efficiency) is shown to lead to a shift of this range towards larger angles of lag. A new structure of the Gunn diode is suggested, which involves special cathode contacts consisting of alternating quasiisland ohmic contacts and control electrode domains. COUCH, N.R. ; BETON, P.H. ; KELLY, M.J.; KERR, T.M. ; KNIGHT, D.J. ; ONDRIA, J. "The use of linearly graded composition AlGaAs injectors for intervalley transfer in GaAs: theory and experiment," Solid-State Electronics, v.31, n.3-4, p.613-616, 1988. DOI: https://doi.org/10.1016/0038-1101(88)90353-X. KANEVSKII, V.I. ; KOZYREV, Y.N. ; SUKHINA, Y.Y. ; POBOKIN, D.Y. "Fizicheskie protcessy v diodakh Ganna so slozhnym katodom (modelirovanie metodom Monte-Karlo)," Radiotekhnika i Elektronika, v.40, n.1, p.147-153, 1995. KANEVSKII, V.I. ; CHAIKA, V.Y. "Modelirovanie fizicheskikh protcessov v diodakh Ganna s ostrovkovymi inzhektorami goriachikh elektronov," Izv. VUZ. Radioelektronika, v.43, n.8, p.73-80, 2000. JACOBONI, C.; REGGIANI, L. "The Monte Carlo method for the solution of charge transport in semiconductors with applications to covalent materials," Rev. Modern Phys., v.55, n.3, p.645-705, 1983. DOI: https://doi.org/10.1103/RevModPhys.55.645. LITTLEJOHN, M.A. ; HAUSER, J.R.; GLISSON, T.H. " Velocity-field characteristics of GaAs with Γc6-Lc6-Xc6 conduction-band ordering," J. Appl. Phys., v.48, n.11, p.4587-4590, 1977. DOI: https://doi.org/10.1063/1.323516. RUCH, J.G. ; FAWCETT, W. "Temperature dependence of the transport properties of gallium arsenide determined by a Monte Carlo method," J. Appl. Phys., v.41, n.9, p.3843-3849, 1970. DOI: https://doi.org/10.1063/1.1659516.